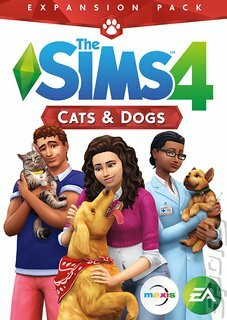 This highly anticipated expansion pack allows players to experience the cuddly companionship and delightful surprises cats and dogs will bring into their Sims daily lives. The all new Create A Pet tool provides players with the ability to create and design their perfect pet. Choose from an expansive variety of cat and dog breeds or mix multiple breeds to create something truly unique. Customise furry friends coats with crazy patterns or match the spots and stripes of an in-game pet to a real-life pet. For the first time ever, special outfits and accessories will also be available to finish off the look, and tailored personality traits ensure no two pets are alike inside-or-out. The animals unique personality traits will be discovered along the way as Sims care for, train and play games with their pets. A brand-new veterinarian business will allow players to pursue dreams of building their own veterinary clinic, hiring a dedicated staff, and diagnosing and curing pets from the occasional fleas to the more bizarre sicknesses they encounter. Lastly, The Sims 4 Cats &amp; Dogs will expand The Sims 4 with the beautiful coastal shores of a brand-new world, Brindleton Bay. Here Sims and their pets can play fetch near the harbour docks, take a walk to the lighthouse, visit a park to setup an obstacle course, meet other pet-loving locals, and even find stray pets that Sims can take in as their own!